Rock climbing is a sport in which participants climb up or across natural rock formations or man-made rock walls with the goal of reaching the summit of a formation or the endpoint of a pre-defined route. Rock climbing is similar to scrambling (another activity involving the scaling of hills and similar formations), but climbing is generally differentiated by its need for the use of the climber's hands to hold his or her own weight and not just provide balance. Aid climbing (climbing using equipment that act as artificial hand- or footholds) became popular during the period 1920 - 1960, leading to ascents in the Alps and in Yosemite Valley that were considered impossible without such means. 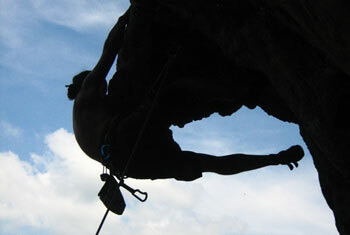 However, climbing techniques, equipment, and ethical considerations have evolved steadily, and today, free climbing (climbing on holds made entirely of natural rock, using gear solely for protection and not for upward movement) is the most popular form of the sport. Free climbing has since been divided into several sub-styles of climbing dependent on belay configuration (described below). Over time, grading systems have also been created in order to more accurately compare the relative difficulties of climbs.